As a multi-user workstation for reading or watching TV on a lunch break. Don't expect to type productively or be able to concentrate while pedaling. Lifetime frame, 2 year parts, 1 year labor. Well-built mechanically. Comfortable seat, at least for short durations. Great for getting some cardio while watching TV or reading. Console includes one rear USB port for charging portable devices such as an iPod or cell phone. Don't expect to type comfortably or with proficiency while mounted. Clearly designed to be used as an exercise machine, not in front of a desk. Ergonomically a nightmare. Lacks things you'd expect at this price range—like a real Bluetooth interface to real phone apps and to popular wearable devices like Fitbit— which are missing. Difficult to mount and dismount, no matter user's height. Hard to move despite built-in wheels. Weak sales since its introduction a few years ago has led to deep discounting. Multiple design flaws stem from the fact that this was originally designed as an upright cardio exercise bike, simply re-skinned and re-positioned as an office fitness product to broaden out Lifespan's popular treadmill desk line (which has seen far greater success). Poor reviews from verified buyers on Amazon confirm what our review experts have long said about this product. If you don't want to be disappointed and have to hassle with returning it, move on to one of the many competing products that are twice as good at half the price. 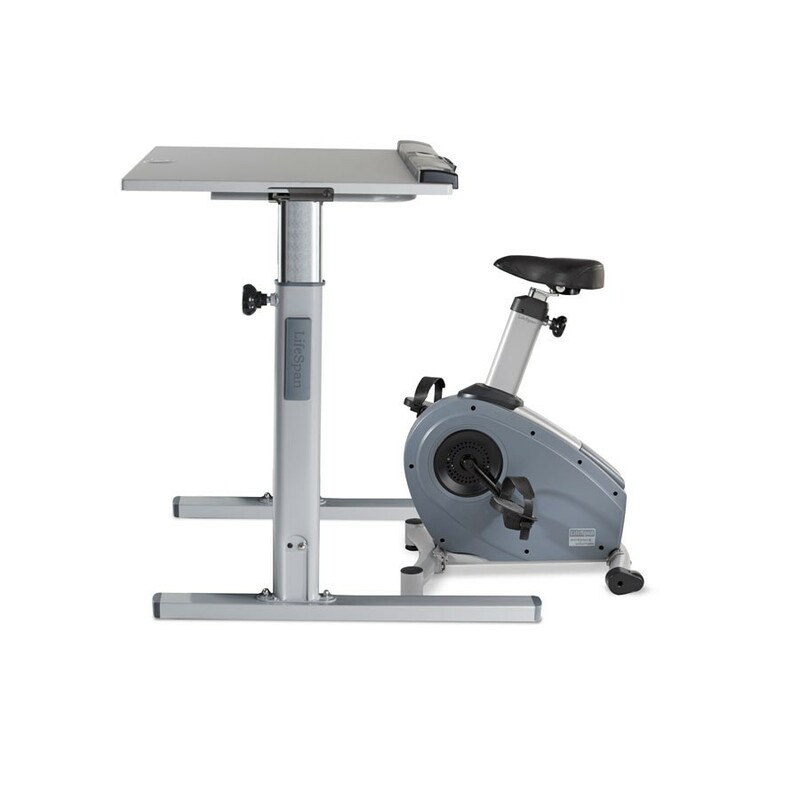 When the LifeSpan C3 Bike Desk was initially released, many in the office fitness industry wondered about the prospects for this machine—which rumored to have been a pet project of one of the company executives. Introduced at a price of $999, the product has since been gradually marked down to $729 (and still dropping? ), indicating a distinct lack of demand for it. Indeed, customer reviews on Amazon amount to a handful—and half of those from people who gave it 3 stars while still returning the unit—while the Lifespan treadmill desks have garnered hundreds over the same timeframe. Again, an indication of a lack of popularity. One contributing reason may be the very low average rating of only 3 stars, which, given how optimistic Amazon customer rating stars usually are, and given what this handful of customers wrote about the product, leads one to imagine that its future prospects are no less bleak than its historical success. LifeSpan Fitness, a cardio fitness equipment brand of Taiwan-based Strengthmaster, and maker of the TR800, TR1200 and TR5000 treadmill desks, introduced the C3-DT3 Under Standing Desk Bicycle in 2013. It is a variant of the LifeSpan C3i upright exercise bicycle, with a small desktop control console (similar to the brick used with their treadmill desks) replacing the handlebars and large display/input console that you're used to seeing attached to an exercise bike. As they've done with their treadmill line, there are "C3-DT5" and "C3-DT7" versions of this setup, sporting manually and electrically adjustable-height desks, respectively, in a bundle with the bike. For the same reasons we don't care for the ergonomics and aesthetics of the DT5 and DT7 desks when used with an office treadmill, we would advise pairing the C3 with any number of better, more attractive adjustable-height desks. One thing Lifespan is known for is solid mechanical construction. Like their treadmills, the C3 desk bike is built to last, at least as far as mechanical components are concerned. One demonstration of this is the extraordinarily high user weight capacity, which Lifespan claims to be 400 lbs. Oddly enough, however, this is one of the few desk bike products that only pedals forward—it literally won't go in reverse like most of its competitors can. Users report the seat to be comfortable, albeit not for long periods of time. Electronics and software have long been a weakness for this product group, with minimally functional, membrane keypad consoles and old-style LED readouts. There are no LCD displays here, no programs to run, and no memory to hold a record of your activity. While the unit does have a Bluetooth transceiver, the software and apps its supposed to connect to just about never work and quickly frustrate users to the point that no one ever bothers to sync their data. Forget syncing to your Fitbit or other wearable devices. Complaints have mounted over this poorly designed Bluetooth interface for as long as Lifespan Fitness has been in the office fitness business; there appear to be no plans whatsoever to update it. When devices like the Cubii smart under desk elliptical come with well-written, feature-packed apps for iPhone and Android—and seamless integration with popular wearables like FitBit and Jawbone—at less than half the price, you have to wonder what the engineers in Taiwan were thinking with the C3. You can read, watch TV, or talk on the phone, but like the model in this photo, you won't actually be able to pedal while typing on a computer with any sort of proficiency or comfort. Ergonomically, things go from bad to worse. First of all, you can forget about typing productively while pedaling. Typing at a computer while seated at this bike desk quickly becomes uncomfortable—and if you start pedaling in a crouched-over position, leaning on your mid forearms to support your upper body, it will put you into physical therapy in short order. Even mounting and dismounting from the bike seems to be exceedingly awkward—with shorter, average height, and taller users all complaining about how uncomfortable it is to do so. Several users reported returning the product for this reason alone. Weighing in at 85 lbs, the Lifespan C3 Bike Desk is ungainly and not all that easy to move, despite the built-in wheels. For all its success in the treadmill desk business, Lifespan has blown it in the desk bike category, trying to get away with "re-skinning" a cardio exercise upright bike and positioning it as another office fitness product to complement the rest of the line. 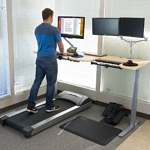 There are pros and cons to each, as we discuss in this article about Treadmill Desks vs. Desk Bikes, that consumers should consider before choosing one type of device over the other. But let's be clear on one thing: while it is true that walking while typing results in more blood flow to the brain, greater focus ability, and (presuming your ergonomics are set up correctly) higher productivity, desk bikes, generally speaking, are more about getting cardio workouts than fighting off sitting disease—or getting a lot of work done at the same time as you're getting some healthy movement. We totally recognize that thousands of mini elliptical trainers and under desk cycles are sold each month, largely to cycling enthusiasts who want to keep working those quads while they're on the job. From an office fitness standpoint, there are some drawbacks to keep in mind, but one thing's for sure: The design of the product and the ergonomic setup of your workstation are paramount to success. If you haven't yet, check out our round-ups of Bike Desk Reviews, as well as the related Desk Cycle Reviews, before choosing the best product for your particular needs.